I'm going into the 11th grade at Conestoga High School in Pennsylvania. I have participated in many math competitions such as Pu MAC, ARML, and HMMT, and have gotten to USAJMO this year. I also participated in the PClassic programming competition at UPenn this year. I play clarinet and enjoy listening to music, chatting with friends, and doing other stuff on the computer. I hope to have fun with everyone at camp this year! Project: Betting Strategies: Should I Play or Run Away? 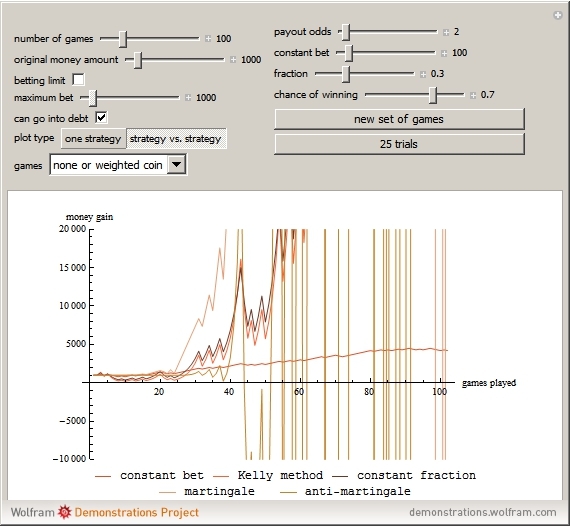 This demonstrates the effectiveness of common betting strategies against different winning probabilities. Presettings to roulette are supplied with other games to possibly come.